Sometimes when suffering from designer’s block on a project, it is good to get away from the task at hand and recharge your ID batteries in other ways. I find it therapeutic to seek out inspirational design, blog articles, and of course elearning heroes challenges. After upgrading to SL2 late last year and working through work-related courses, I hadn’t yet had the opportunity to test out the new interactive sliders feature. While reading an eLearning Guild research e-book on writing assessments, their illustrations on Bloom's Taxonomy captivated me and gave me an idea. A little over one year ago, I set wheels in motion to begin an Articulate user group in the DFW area. Based on a conversation with David Anderson of Articulate at an October 2012 workshop, he inspired me to gather a like-minded group of individuals for the purposes of nerding out on what we do for a living. Ok, maybe that was MY purpose for wanting an Articulate user group. At any rate, for whatever intrinsic value I may receive from assembling this group, it has far exceeded my expectations. One year later, I'm happy to report we are a group of 75 strong and have hosted 5 meetings thus far. Our conversations are lively, our discussions are informative, and our quest for learning better ways to create elearning is never ending. It's no secret that my husband and I love to travel. In fact, we've been to some pretty cool places: Iceland, Sweden, Denmark, Germany, Prague, Austria, Barbados, Curacao, and Mexico. We've been to most large cities in the U.S. (with the exception that I haven't been to NYC yet...*gasp*). When I saw this challenge, there was no way to avoid it, especially once I saw the other amazing creations born from it. 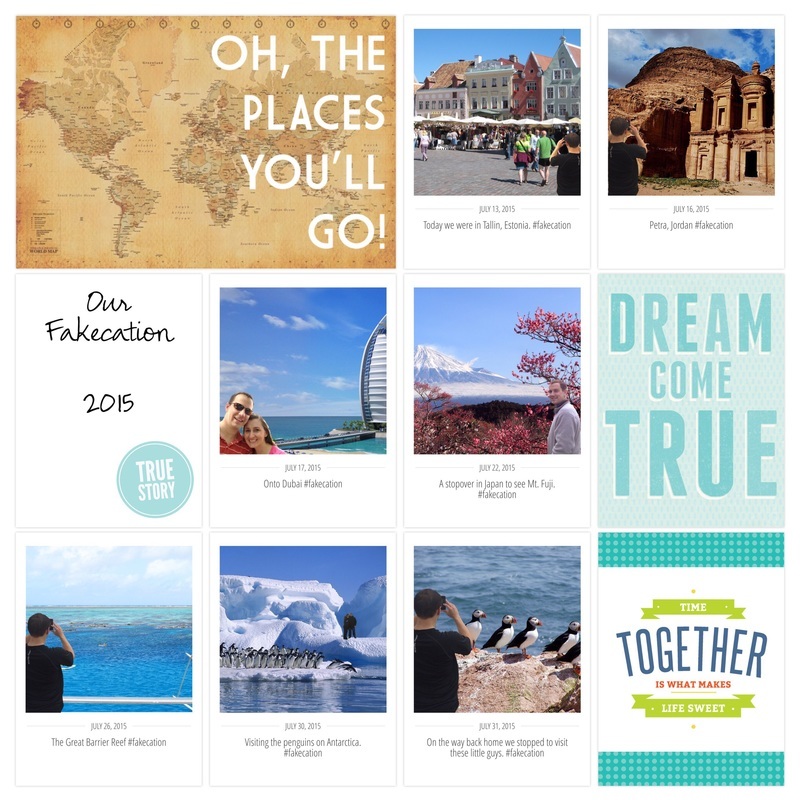 Using photos of my husband and I that I had saved on my phone; images obtained from a Bing search using ‘public domain’ or ‘free to share and use’ licenses; and my favorite photo editing tool—PowerPoint, I set off to create our amazing Fakecation 2015. NOTE: PowerPoint isn’t a sophisticated photo editing tool, but it is darn easy and convenient anyways. Plus, once you see the end result, you’ll see why using PPT for this challenge was a no-brainer. After pairing bucket list travel destinations that we’d actually like to some day visit, I did exactly what I do when we actually travel—I made a scrapbook layout. Together with the ﻿Project Life app﻿ and Collect app, I created my page. Check out the final result of our glorious trip to see Estonia, Jordan, Dubai, Japan, the Great Barrier Reef, Antarctica, and visiting the puffins off the coast of Maine (as per Bing) and not Iceland as I had hoped). Not pictured was our trip to Santorini and Easter Island. Don't you just love when a design just comes together after struggling with the concept for a few days? After finding out that my local library offers access to digital magazines, I finally decided to flip through one and simply fell in love. Design, specifically fonts and creative layouts, are near and dear to my heart--I must have been a graphic designer in another life. Shortly after my digital magazine experience, David Anderson posted an Articulate E-Learning Heroes Challenge on digital magazine layouts. *SWOON* The hard part was figuring out how I wanted to put together my own layout. When faced with designing a course, I usually find inspiration from templates, the Articulate community challenges, pinterest, or now digital/print magazines. But this time, I kind of wanted to find a layout that just worked with my eye. When David Anderson tasked the Articulate community with designing an elearning interaction using Pantone's 2015 color of the year, I jumped on it. While many do not like the color choice, I happen to be the opposite. I LOVE this color. However, it must be said that I do not love the color swatch, I love this color in images, on people, and in food, etc. 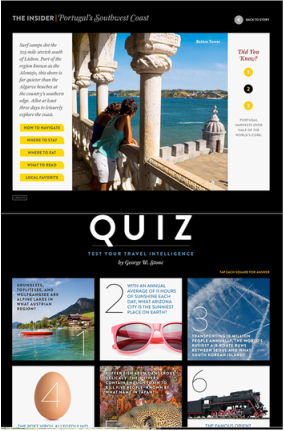 After struggling for a while to figure out how I wanted to design my layout, I remembered digital magazine layouts I screen captured for future inspiration from National Geographic Traveler. It has been a while since I've had a chance to participate in one of the WONDERFUL eLearning Hero Challenges conducted by Articulate Community Member, David Anderson. Attempting to improve my skill in designing graphics in Powerpoint is one of my professional goals, even if I never end up using whatever I create. In the past, I built the magnifying glass below using inspiration most likely from an Articulate post and it seems as though it was from the Chief NuggetHead himself. Update: I actually went back into the archives of my Instagram account to find both images were created 21 months ago and the pushpin was definitely inspiration from a screenr that Kevin (Chief NuggetHead) recorded. I believe the magnifying glass was simply an image I wanted to recreate. I simply couldn't resist jumping into this challenge. At first, I was all excited because I'd finally get to test the Paper Fifty Three app that I downloaded on my iPad, UNTIL I read that this was a paper/pen kind of challenge. I often suffer from designer's block when it comes to challenge ideas and I tend to begin with the best of intentions to finish. Designer's block either takes over, or the perfectionism latches on and before I know it, I've forgotten all about my idea in the first place. Anyways, today I muddled through my idea and created a disaster plan near and dear to my heart...hurricanes. Being from south Louisiana, hurricane season trumps all other seasons. Your life is often defined by the hurricanes you've been through, for instance while everyone remembers Hurricane Katrina, my memory is of Hurricane Andrew, August 1992. While my family evacuated to safety, my dad stayed behind to guard our property. We returned after several days away from home to have no power for nearly two weeks. If you've ever been to Louisiana, you know we have horrid humidity and if you've ever been fortunate enough to visit in August--it is unbearable. Thankfully, we sustained little damage to our home and even the family business. Many could not say the same, including our next door neighbor who suffered major damage to the second floor of their house. At any rate, here's my attempt at a hurricane disaster "newspaper." I love infographics. For both the beauty of the design and the amount of information provided. Infographic turned eLearning interaction challenge...I'm THERE. Introducing eLearning Heroes Challenge #23. The challenge tasked users with turning a leadership style infographic/decision map into an eLearning course. Hi my name is Kimberly Bourque Valliere and I'm an Instructional Designer; lover of technology, Articulate Storyline, pictures, and learning. Take a look around and if you'd like to see my formal portfolio, click the link above.